Thoughts about wine blends have been sloshing around my head just recently, as I’ve been thinking about a tasting of them (a wide variety of local red examples) that I’m presenting this Wednesday at the Hermanus Fyn Arts festival. I suspect, first of all, that South African winemakers show an interest in blending different varieties to a degree rare elsewhere, and with a great deal of flair too. Where else in the New World, for example, are blends almost indisputably the highest-rated category of white wine? Two categories, even: those made according to the basic Bordeaux mix of sauvignon blanc and semillon, and the unique “Cape blend” based on chenin blanc and responsive above all to local conditions. For reds, it seems to me typical that the debate over the red “Cape blend” featuring pinotage continues (now more mutedly, however), alongside emerging excitement about the prospects of reviving an old local tradition of blending cabernet sauvignon with cinsaut, as I mentioned last week. Of course, a continued focus on varietal wines continues here – surely at least partly because of an international market conditioned by the USA’s, and then Australia’s, near-obsession with such wines. The classic European tradition, of course, was to market wines according to their origin, and most customers had no idea of the varietal origin of, say, Bordeaux or Sancerre. The US swing to using varietal names as marketing tools goes back to the 1970s, when blends were still mostly opportunistically designed rather than carefully considered, and generally given spurious names like Hearty Burgundy. It quickly became a signifier of quality to call your wine “Cabernet Sauvignon” or “Merlot”, and it seems that the idea took root that if variety is good, then single variety must be better. For various reasons (including the length and nature of our winemaking tradition, and our continuing obsession with France as a model), this monovarietal idea is less powerful here, it seems to me, than in other New World countries. That’s a good thing, I’d say, the source of much that is unique and excellent locally, allowing for great flexibility in responding to terroir, and given winelovers wider choice. Sometimes, however, we even go in the blending direction to an extent that leaves the French model way behind. If a blend is good, then as many varieties as possible is better! Take red Bordeaux blends. The great majority of modern red Bordeaux is a blend of two, perhaps three, of the five currently most common varieties: cabernet sauvignon and merlot above all, followed by cab franc, petit verdot and malbec, with a few carmenère vines grown. I don’t know of any Bordeaux wine that includes all of them, certainly not among the leading names (but coincidentally, last night at my tasting group we had a decent Canadian full-house wine). Yet in South Africa, to have all five has become something to boast about. (it’s been tacitly agreed to forget about carmenère, so that we can speak of “all five”. 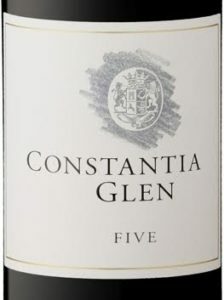 A number of producers even name their wines accordingly: think of De Toren Fusion V, Constantia Glen Five, Gabrielskloof Five Arches, Raka Quinary and – the most recent idolator, as far as I’m aware – Van Biljon Cinq, which makes its obeisance even clearer by translating “five” into French. In fact, the very first commercially released Cape Bordeaux-style blend, Welgemeend Estate Wine 1979, included all five. Well, actually it didn’t, though its creator, Billy Hofmeyr thought it did: the petit verdot (used in tiny quantities) was later realised to be something else entirely…. This is all quite endearing, in fact, and I shouldn’t think that the quality of any of the wines is compromised by the felt need to include at least a tiny percentage of all five grapes. Tim re the cab/cinsaut blends, Rustenberg’s dry red was traditionally 2/3 cab 1/3 cinsaut. It was apparantly bottled every year from 1900 until, I think 1988 was the last year before Simon Barlow (who took over in 1987) was advised to pull up the cinsaut vineyard and plant merlot etc. The cinsaut vines were 80+ then. The wine had been made only by 3 people since 1900 (Etienne Le Riche being the 3rd, and Reg Nicholson before him) and was made using wild yeasts. It’s terroir character was so strong that a Rustenberg Dry Red or Cab would immediately announce itself when served at a tasting. In the late 1980’s/early 1990’s I drank vintages back to the 60’s and 50’s (thank you Ken!) and they were remarkable wines. I have two of the last vintage 1988 left, it will be interesting to see if the longevity has continued. I will broach them in a nostalgic fashion – a Cape Classic with a remarkable history terminated in the name of progress!